Dear shocked children of God: grace, mercy, and peace to you from God the Father and our Lord and Saviour Jesus Christ. Amen. Well you are shocked, aren’t you? The leaders of the church come to Jesus to ask Him who He gets His authority from, but instead of answering them He gives them a question in return. And when they don’t answer His question, Jesus tells them that the tax collectors and prostitutes go into the kingdom of God before them. Jesus says that swindlers and hookers are going to heaven before the leaders of the church! Shocking! Tax collectors were not quite the same as Revenue Canada agents today, as much as you may dislike them. At this time the Romans occupied the Jewish lands with their armies and exacted taxes from the Jews. But instead of using Roman tax collectors, the Romans got Jews to collect the taxes from their fellow countrymen. Thus, the tax collectors were seen as being collaborators with their oppressors and traitors to their own people. Further, they made most of their money by abusing their position and overcharging their fellow Jews, even resorting to violence to collect money and extort their brothers. Prostitutes were also in this same class of immorality. Despising God’s gift of marriage, they sold their bodies for fornication, as prostitutes do today. Like the tax collectors, they were openly immoral and lived a life contrary to the Law of God. Prostitution was also an important part of the worship of idols in various temples so prostitutes also led people away from God to idolatry. Yet Jesus says that tax collectors and prostitutes go into the kingdom of God before these leaders of the church. Those who extort money are going to heaven before those who generously support the church with their offerings. Those who spend the night walking the streets are going to heaven before those who spend their Sunday mornings in church. Shocking, isn’t it? This all takes place during Holy Week, days before Jesus was to be crucified. Three years earlier, these church leaders had already questioned Jesus’ authority (Jn. 2:18), and despite three years of teaching, these chief priests and elders refused to believe what Jesus told them. Even though they saw the miracles, heard the teaching, and witnessed Jesus’ triumphal entry into Jerusalem, they did not believe. They still questioned Jesus, “By what authority are you doing these things, and who gave you this authority?” At this point, Jesus only had a few days left until His crucifixion. He shocks His hearers in this eleventh-hour call to repentance in order to bring them into the kingdom of heaven. Jesus responds to them with a question. He asks them concerning the baptism of John, “From where did it come? From heaven or from man?” In other words, who gave John the Baptist the authority to do what he did? By whose authority did he call people to a baptism of repentance? There are only two possible answers. Either his authority is from heaven or from man; either it is from God, or it is not from God and is only made up by man. These are the exact same two possible answers for the source of Jesus’ authority. If the chief priests and elders answer Jesus’ question correctly, they will also answer their own question correctly. But they refuse to answer. Neither son had any intention of going. But the first repented of his disobedience and hard-heartedness and did the will of his father. The second pretended that he would do the will of his father, but did not. He puts on airs and acts obedient and faithful, but has no intention of following his father’s will. Here then Jesus explains why tax collectors and prostitutes are going into the kingdom of heaven before the chief priests and elders. That is why the tax collectors and prostitutes are going into the kingdom of God before these leaders of the church. Further, even when these leaders saw the change in the tax collectors and prostitutes, they did not believe. Even though they saw the change in the lives of these sinners who turned from their ways because their sins were forgiven, they still did not believe. They still rejected John and thus they still rejected God who gave John the authority to do what he did. They rejected the forerunner, thus they rejected also the Messiah Himself. See, these church leaders and regular church attenders saw no need to repent. Sure the tax collectors and the prostitutes need to repent, but not us. We’re good. We don’t steal from others. We are faithful to our spouses. We’re in church on Sundays. But Jesus tells them the extortioners and whores are going to heaven before them. The chief priests and elders were so caught up in what man does and does not do, that they were missing the way to heaven. They thought the way to righteousness was in what they did to please God. They thought avoiding what is bad and doing what is good would bring them into the kingdom of heaven. But that’s not the way to heaven; that’s the way to hell. Nothing you do can save you. God sent John to preach this but they rejected him and the word of forgiveness he preached. Thus they also rejected Jesus and the word of forgiveness He brought. They thought they had no need of forgiveness, so they rejected the forgiveness offered, and thus rejected the kingdom of God. Meanwhile, the tax collectors and prostitutes saw that they were not pleasing to God and they believed John’s preaching of the forgiveness of their sins. They believed that there was nothing they could do to save themselves and they rejoiced in the forgiveness freely given them. Through the forgiveness of their sins, they were brought into the kingdom of God. Jesus’ shocking message is also directed at you. Do not think that avoiding what is bad and doing what is good will bring you into the kingdom of heaven. That would be a rejection of Christ and His authority; it is a rejection of the forgiveness of sins. Instead, believe that there is nothing you can do to save yourself and rejoice in the forgiveness freely given to you. Know that through the forgiveness of your sins, you have been brought into the kingdom of God. This is even more shocking. Free forgiveness. The vilest of sins washed away. Open sinners brought to repentance by the powerful word of forgiveness. And it’s not based on what you’ve done. Jesus did it all for you. His blood shed on the cross forgives you all your sins. His blood can wash the sins of those who have walked in open shame and vice, even extortion and prostitution. It can wash away the sins of those who have walked in conceit and pride, thinking they are better than others and have no need of forgiveness. Jesus’ blood washes away your sins. So be shocked, and believe the word of promise: your sins are forgiven you. Amen. Dear beggars who will receive your wages: grace, mercy, and peace from God the Father, and our Lord and Saviour Jesus Christ. Amen. The life of a day labourer in the time of Jesus was not an easy one. They didn’t have a steady income, so they would be delighted to be called into someone’s service, so that they could eat along with their families. Day labourers could not afford to be without work. Too many days without work could well mean going without food. In our Gospel lesson this morning, Jesus tells the parable of a master of a house who went to hire day labourers for his vineyard. He goes and hires labourers first thing in the morning and calls them into his service. Undoubtedly, these labourers would have been glad to receive work for the day, knowing that they have secured their livelihood for the day. The master goes out again about the third hour, which would be 9 in the morning. He sees others standing around idle, so he graciously calls them into his service also, so that they don’t have to waste their day without purpose and without means of support. By noon, those still looking for work would start to see hope fading. Half the day is gone and they have nothing to show for it. What are the chances they will still get hired? Even more so for those still loitering around at the ninth hour, or 3 in the afternoon. Desperation starts to set in. What are we going to do? We can’t go home with nothing. Those remaining in the eleventh hour had undoubtedly given up hope completely, but having nowhere else to be, they just stood around. With only one hour left in the day, the only question on their minds is where they will get food and drink, maybe a place to rest. When the master shows up and calls them into his vineyard, we can imagine them breathing a sigh of relief – at least they can hope to get some food with what they might earn in this last hour. Their excitement was undeniably greater than the excitement of those hired first, who didn’t have to go through most of the day suffering doubt about their unknown future. On top of it all, they end up receiving a denarius each, a full day’s pay! They understood the graciousness of the master in hiring them in the first place when the day was nearly over, and now he pays them what they certainly did not deserve, a full day’s pay. Though they were hired last, they got paid the same as those who were hired first. When it was their turn to get paid, those who had been hired first expected that they should get more than they were promised. They had been promised a denarius – a day’s pay – but seeing those who were hired for only one hour receive a denarius, they thought they deserved more. After all, they carried the burden of the day and the scorching heat; they worked 12 hours instead of one. The pay seemed unfair to them. They were hired first; they thought they should get paid more than those who were hired last. We, like these first workers, are so ready to calculate our cost of following Jesus; what it has cost us to be in His kingdom. We may have friends, co-workers, or family that ridicule us because of our faith. Our honesty in work situations may have cost the company profit and caused us personal loss and the displeasure of our boss and co-workers. Our standing up for the truth of the Word of God on issues such as abortion, euthanasia, and living together outside of marriage may have caused us to be unpopular and even despised. We are so quick to notice what following Jesus has cost us. Many of us may want to ask Jesus if He has forgotten all that we have sacrificed to follow Him. We want Him to notice what following Him has cost us and pay us our reward. But we must always remember that we are on the receiving end. Jesus is always giving to us. In our spiritual poverty, Jesus gives us His Spirit. We, who have nothing to offer God, receive everything from Him. Eternal life is a gift given to us, poor spiritual beggars that we are. The last thing Martin Luther wrote before he died is a mediation in which he wrote, “We are beggars. That is true.” He understood the cost of following Jesus. He spent much of his life sick. He faced the disappointment of his father because he became a monk instead of a lawyer. He spent time in hiding for his life because there was a bounty on his head. He was excommunicated by Rome, and faced opposition everywhere. But the very reason he was so willing to suffer and work in the service of his Master was because he had come to realize that he was a beggar. He had come to realize that forgiveness is a free gift. Luther was happy that he had been called at noontime into the master’s service, and was eager to work the rest of the day to ensure that those standing idly by might also be called into the vineyard. We don’t like to think of ourselves as beggars. We take great pride in our own accomplishments and self-sufficiency. We don’t even like to ask anyone for anything. But in our relationship with God, we have nothing to offer. We cannot point to anything we have done in our lives and claim merit for it. Whether He calls us first or last, before God, the only thing that’s great about us is our sin. Jesus says that many who are first will be last to humble those who think they are great before God, so that they would not trust in themselves, but only in the mercy of God. Someone who has been blessed to be in God’s kingdom since his baptism as an infant might be tempted to think that he deserve extra rewards in heaven, at least a few extra square feet compared to some others. Someone who suffers persecution and a martyr’s death might feel that he deserves a greater reward than one of his persecutors who turns to God in his final hour. But Jesus is teaching us not to focus on our cost of following Him, or anyone else’s cost. He is the one who paid for our heavenly reward. Our entrance into His eternal kingdom cost Jesus His life. And this payment is good for those who enter His kingdom early in their lives and for those who enter in their eleventh hour. This payment is for those who are first and those who are last. Jesus also says that the last will be first so that those who know they are nothing before God will not despair; so that the spiritual beggar will trust in the goodness and mercy of God and know that he will get a reward that he does not deserve. Jesus equalizes all the servants that are called into the vineyard. He abolishes all human merit, leaving only the graciousness of the master to be praised. And whose day was really better – those who were called early in the morning or those who had doubts throughout the day; those who knew they were secure in the master’s mercy or those who went the whole day wondering if they would be shown mercy? Whose life is better, those people who have served God from baptism as infants or those who wander their whole life without God, idle and without purpose, and finally receive forgiveness on their deathbed? Here too, we see the love and graciousness of God. He doesn’t stop calling people into His kingdom. He doesn’t say that since you didn’t grow up knowing Him, you have no place in His kingdom. You may even have wandered away from Him, but He is always calling you back. He wants you in His kingdom, where He will reward you with wages that you do not deserve. “For the wages of sin is death, but the free gift of God is eternal life in Christ Jesus our Lord” [Rom. 6:23]. The wages that we deserve for our lives of sin is death. But God, our heavenly master, gives us wages that we do not deserve – the free gift of eternal life in Jesus. He calls you to receive your wages. Whether He called you early in your life or is only now calling you, perhaps even in the eleventh hour, He wants to give you what He earned for you – eternal life. And those of us already in His kingdom should be more than overjoyed that God is still calling people out of lives of idleness and sin into His kingdom. No, they do not deserve it. But neither do we. We are all beggars. It is true. But we will receive our wages, even though we do not deserve them. Amen. Dear forgiven debtors: grace, mercy, and peace to you from God the Father and our Lord and Saviour Jesus Christ. Amen. If you are deep in debt, the last thing you want to hear is that your creditor is looking to settle accounts. When you are unable to pay what you owe, you don’t want your creditor to come looking for you. In Jesus’ parable we heard this morning, we hear of a servant who is in exactly such a bind. To say that he is in serious debt is an understatement. He owes 10,000 talents. For a day labourer, that’s the salary for sixty million days of work. Sixty million days. The master knows that he will never receive from the servant what he owes. It’s an impossible debt. So the master ordered the servant to be sold along with his wife, children, and everything that he had so that he could at least recover something out of what he is owed. He wouldn’t even be able to recover pennies on the dollar. What he could recover would be insignificant. Not even a drop in the bucket. More like a drop in the ocean. Nevertheless, it is time to settle accounts. “So the servant fell on his knees, imploring him, ‘Have patience with me, and I will pay you everything.’” The servant is of course delusional. There’s no amount of time that would allow him to pay the debt. He doesn’t have the one hundred sixty-five thousand years it would require to work off the debt. It’s an impossible debt. The servant isn’t even asking for mercy. He’s asking for time to pay his debt. He’s asking for the wrong thing. Time will be of no help to him. It is an impossible debt. But the master has compassion on his servant. Out of the blue, the master releases him and forgives his debt. The impossible debt disappears as if at the snap of the master’s fingers. Two thousand lifetimes worth of debt are erased. The servant’s account is settled. You would expect his life to have changed completely. He went from being buried under a mountain of debt into which he could never put a dent in his lifetime, to having no debt whatsoever. Not a penny of debt. Instead of being sold into slavery along with his wife and children, he and his family are free, with nothing hanging over their heads. But it was not so. His life was not changed. He didn’t really think that he had been forgiven all that great of a debt. After all, he had said that he just needed a bit of time to pay it off. He felt that his debt was tiny and didn’t require all that much mercy to be forgiven. He saw no change in his life. When he departs, he sees his fellow servant who owes him one hundred denarii, and he grabs him by the throat and chokes him, demanding payment be made. Having just been forgiven sixty million days’ wages, he chokes his fellow servant for one hundred days’ wages. The servant has managed to skew the sizes of the debts. He thinks that he has been forgiven very little, yet his fellow servant owes him such a huge debt, that surely he has a right to collect. Surely no mercy can be expected from him for so great a debt. His fellow servant did exactly what he had done earlier. He fell to his knees and pleaded for patience and promised to pay his debt. In this case, there actually is a realistic expectation that the servant could pay his debt. Given time, it would have been possible to pay it off. But this wicked servant would have none of it. He threw his fellow servant into prison until he would pay his debt. No one could be this cold and hard-hearted after having received such mercy, unless he thought that the debt he had been forgiven was tiny compared to the debt that he was owed. He was unable to forgive his fellow servant because he felt that the size of his fellow servant’s debt was just too great to forgive. And because of his skewed view on the relative sizes of the debts, not only did he act unmercifully towards his fellow servant, but the mercy offered to him was also revoked and he himself was thrown in jail forever, because he will never be able to pay all of his debt. Jesus uses this parable to teach us about forgiving those who have sinned against us. Along with Peter, we wonder how many times we must forgive those who sin against us. We may even offer what we think is a generous number of times to forgive – seven. We struggle to forgive because we think that those who have sinned against us owe us huge. We think their sins against us are so great that we have a right not to forgive them – my sister who cheated me out of my inheritance; my spouse who was unfaithful to his marriage vows; a drunk driver who killed my child. We look at the sins of others against us as if they are gigantic and unforgiveable, but our sins as tiny and insignificant. Thus we think we deserve forgiveness for our little sins, but those who sin against us do not deserve forgiveness at all from us. We skew things so badly and think that this is justice – because we deserve forgiveness but those who sin against us do not. Jesus points to the reality of the situation: the sins of others against us are next to nothing compared to our sins against God. Along with Peter we may think that we have little to be forgiven, but we will forgive the gigantic sins of our brother seven times just because we are so generous and merciful. Jesus takes our skewed thinking and says we are the servant who owed sixty million day’s wages. It is we who owed more than we can pay in two thousand lifetimes. We had an impossible debt, and there was nothing we could do to put dent in that debt. But our Master had compassion on us. Jesus took our debt on Himself. Two thousand lifetimes worth of debt are erased because Jesus paid for them, not with gold or silver, but with His holy, precious blood, and His innocent suffering and death. Our accounts have been settled. Our debt is gone. Our sins are gone. This did not just happen because God snapped His fingers, but because Jesus took our debt on Himself. He took our sins and guilt on Himself. He got buried in our mountains of debt. Yours. Mine. The sins of the whole world. Now we can look at the sins of others against us as they truly are – insignificant compared to how much we have been forgiven. We will never be able to forgive others if we do not see the sin of others as a debt of one hundred denarii to us, and our sins against God as sixty million denarii. We will never be able to forgive others if we think that if God just gave us a bit of time we would be able to repay Him. We will never be able to forgive others if we think that the good things we do – whether coming to church, helping the poor, or even forgiving others are a payment towards the debt that we owe to God. Until we realize that our debt was impossible, and until we can call ourselves “chief of sinners”, we will not be able to forgive those who sin against us. However, when we realize that our impossible debt has been forgiven, we can look at the sins against us as insignificant. When we realize that we can never pay God back for our sins, we will be more ready to forgive those who have sinned against us. When we realize that our account has been settled by the blood of Jesus, then we will not demand the blood of our brother who sins against us. God is the merciful Master who forgives our impossible debt since it was paid by Jesus. God’s mercy in forgiving our great sins moves us to view the sins of others against us as insignificant compared to how much we have been forgiven by God, and thus to show mercy to them. So dear forgiven debtors: forgive those who have sinned against you, because I tell you: your impossible debt is gone. Your account is settled. Amen. Dear community of saints baptized into Christ: Grace, mercy, and peace to you from God the Father and our Lord and Saviour Jesus Christ. Amen. “Sin is no big deal,” says the world around us. If you pay attention to your favourite TV shows, you will see and hear that anything goes. Sin is laughed at like it’s a joke. Fornication is funny. Homosexuality is hilarious. Assault is amusing. Disrespect for authority is delightful. It’s on TV, in movies, books, music, video games, and on the internet. Our children, who have just started school again, also hear as part of their education that sin is no big deal. They are taught that everything is relative. What’s right for me may not be right for you. Do whatever makes you happy. But whatever you do, you better not judge anyone or say that what someone else is doing is wrong; otherwise you will be called a bully and be liable to face charges for a hate crime. We are so immersed in this mind-set that we start to believe it. We start to take sin lightly. When we see others around us get comfortable in sin, even in our own family, we say nothing. It’s no big deal. If our brother despises God’s Word and doesn’t come to church, we say nothing. It’s no big deal. If our brother decides to live together with his girlfriend outside of marriage, we say nothing. It’s no big deal. Contrast this with what we heard in our readings this morning. Jesus said, “If your brother sins against you, go and tell him his fault, between you and him alone.” (v. 15) Jesus doesn’t tell you to ignore it. He doesn’t tell you that it’s no big deal. Jesus tells you to go confront your brother who has fallen into sin and expose his sin. Bring the sin to light so that your brother might be convicted by God’s Word and realize his sin. Notice that Jesus tells you to go and tell your brother his fault between you and him alone. When you see your brother fall into sin, Jesus doesn’t tell you to go tell someone else. He’s not looking for you to start gossiping about your brother. He’s not even telling you to go tattle to your pastor about someone else’s sin. Go to your brother. Tell him. Because his sin is a big deal. If your brother listens to you, you have gained your brother. This is the whole purpose of you going to him: to share God’s Word that would lead him to see his sin and turn from it; to bring to light the seriousness of his sin so that he might understand that his sin is no joke or light matter. You confront him that he might understand God’s wrath against sin so that he won’t accept or tolerate sin. Sin is such a big deal, that if your brother doesn’t listen to you, you don’t just leave it at that. You go with one or two others to confront your sinning brother. And if that doesn’t work, you bring in the whole church; the whole assembly of baptized believers in Christ. Sin is such a big deal that the whole church needs to be involved. If your brother didn’t listen to you when you went alone or to those who went with you later, perhaps he will realize the gravity of his sin when the whole church shows their loving concern for him. Now it’s not just a family member or a friend, but the whole community of believers that are to explain to him just how big of a deal his sin is. If he doesn’t listen to the church, then he is to be treated like one outside the church, no longer a brother. But this too is done with the hope that it leads him to repentance and restoration. All of this points to the fact that sin is a big deal. This is clear from our Old Testament reading also (Ezek. 33:7-9). God tells Ezekiel that if he doesn’t speak God’s Word of warning to the wicked, the wicked will die in his sin, but God will demand his blood from Ezekiel’s hand. Ezekiel becomes responsible for the sinner who does not turn from his wickedness if Ezekiel did not warn him. That’s how big of a deal sin is. It is laid on the head of the sinner and on the head of him who is unfaithful in his duty to warn his brother. What about sin in our own lives? Jesus said, “If your hand or your foot causes you to sin, cut it off and throw it away. It is better for you to enter life crippled or lame than with two hands or two feet to be thrown into the eternal fire. And if your eye causes you to sin, tear it out and throw it away. It is better for you to enter life with one eye than with two eyes to be thrown into the hell of fire.” (vv. 8-9) Sounds like Jesus thinks sin is a big deal. He says that sin is such a big deal that we should cut off from our lives whatever is causing us to sin. The reality is that God thinks sin is a big deal. God does not take sin lightly. In fact, God takes sin so seriously, that He sent His only Son to die for us because of our sin. Sin is such a big deal that no one else could pay the price required; it had to be God Himself who gave His life to take away sin. And sin is such a big deal that God still puts people in our lives who call us to repentance – brothers who come to confront us and tell us our fault so that we might turn away from sin and live. God has also placed us in a whole community of believers that are to confront us and explain from God’s Word just how big of a deal our sin is. And in this community of believers, He daily and richly forgives our sins and the sins of all believers (SC II.3). God knows our weaknesses. That’s why He gives His Word to us, to bring us to repentance and to strengthen our faith. That’s why He gives us the heavenly food of forgiveness in His Son’s body and blood. He does this continually, because He does not want us to wander away from Him. It is Christ who comforts fearful hearts, and brings us back to Himself when we have wandered from Him. We are such a big deal to Christ that He leaves the ninety-nine sheep on the mountains to seek us, the one who has gone astray (v. 12). Our big deal sins of thought, word, and deed, and our darkest secrets that haunt our conscience, are all removed from us by Christ. Jesus made a big deal out of us by dying for us. He washed our sins away. He made us His own in our baptism. Our baptism is something we can always look on, not as a past event, but as a present reality. Baptism isn’t just something that was done to us in the past and has no bearing anymore. Through baptism, we were received into the Christian community, and it is in this Christian community where we still receive the gifts of life, forgiveness, and salvation. In baptism, God put His name on us. Baptism is God’s work and comes with God’s promises of victory over death and the devil, forgiveness of sin, God’s grace, the entire Christ, and the Holy Spirit with His gifts (LC IV.41). These promises which were given to us in our baptism remain ours. As big of a deal as our sins are, our baptism is greater still. Because sin is such a big deal to God, He gave us something even greater to give us victory over sin. 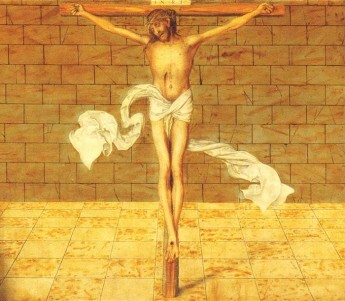 Jesus conquered sin on the cross and gives us the free gift of forgiveness in our baptism, and that gift remains ours. And that’s a big deal. Amen.